CFAC discusses district facility needs - Hamilton School District. The Community Facilities Advisory Committee (CFAC) met again Feb. 2 to continue its study of facility needs in the district. Principals from each school presented information on how space was utilized in their buildings and whether their school could handle increased enrollments. 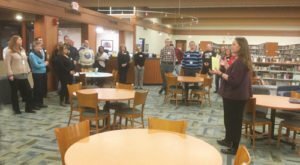 Committee members then toured the high school library and applied engineering and technology areas that includes woods, graphics, metals and autos. meet community expectations to be high achieving and fiscally sensible. CFAC will meet again Feb. 13 to study details of each of the options including cost, programming impact, ability to meet enrollment projections and preliminary design possibilities.